I had the privilege of being in the audience of Dr Tim Elmore’s presentation on Generation iY when he visited my school yesterday. Tim’s work (with Growing Leaders) is about instilling values in youth who will be leaders of future generations. I was informed, moved and challenged to view the Generation iY with different lenses and help them develop values to be leaders, not in the sense of being heads of organizations, but having a leadership perspective, i.e. being personally accountable and having a significant influence on others. According to Tim, Generation iY are those born in the 90s, a group he categorizes as confident, social, tech savvy, family oriented and influential. With a life paradigm ,”life is a cafeteria”, their life is a buffet and the sum of their life is picking and choosing what they like. This generation is markedly different from my generation (Gen X) and even the earlier Gen Yers who were born in the 80s. While this group sounds like they have everything going for them, Tim also pointed out that Generation iY are generally self-absorbed, display low empathy and ambiguous about the future at best. Of the seven reasons that Tim listed for this unique Gen iY personality, I strongly identified with two of them: parenting style and media & technology. My students are Gen iY and as a whole, their life seems to be always in the here and now. They are particularly emotional (or emo as they call it), taking admonishments badly and making the trivial the highlight of their day. You could call it adolescence, you could call it one generation lamenting about the next, but as Tim pointed out, the Gen iY is the first generation that doesn’t need to ask adults to get information. In fact, with the Internet so firmly entrenched in our daily lives, it has become a part of their living environment, especially since they were born into a world that already had it. These kids are “always on”, wired up, and they learn lessons from what they consider the wonderful world of the internet. A student of mine said that she learns about life through Tumblr, though inspirational quotations blogged by people she doesn’t know. These catchy observations of life seem to shape her emotional response, never mind that those emotions will surface at some other point in time. By then, there will be another blog post or twitter update to fix that problem. Please tell me I’m not the only one disturbed that the values and attitudes of this Gen iY (or whatever name you want to give them) are guided and molded by anonymous strangers, distant acquaintances and friends whom have been influenced by the anonymous themselves! I don’t think we can confiscate media & technology and ground kids on a permanent basis. You’ll be screaming for your iPhone if it happened to you. 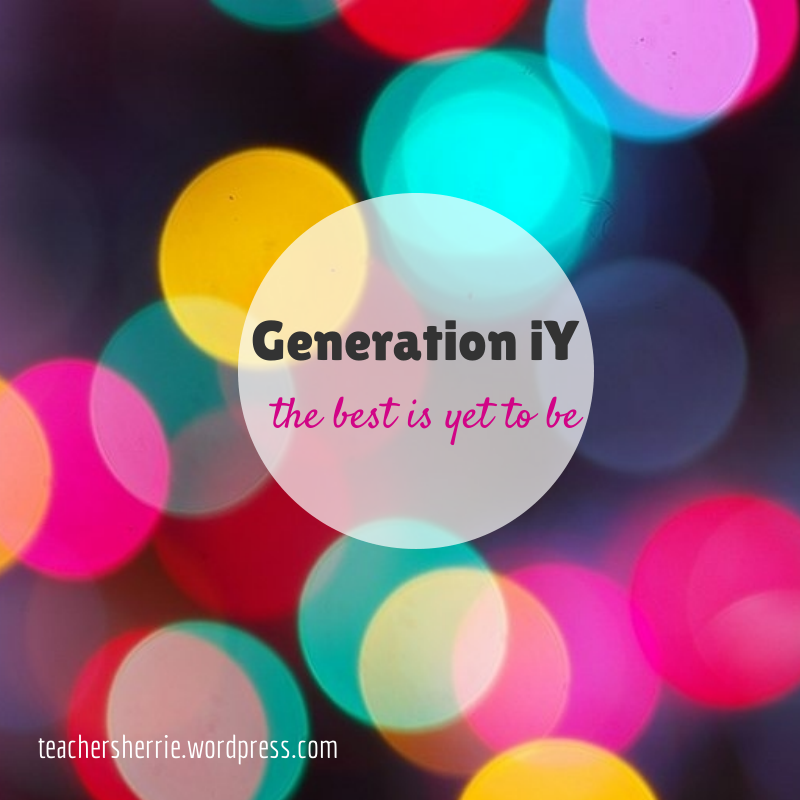 So whether you’re a parent or a teacher, we need to focus on the what we can deal with – the young lives of Gen iY – and do so intentionally and purposefully. It’s a challenge I’m taking up. Shall we do this together? 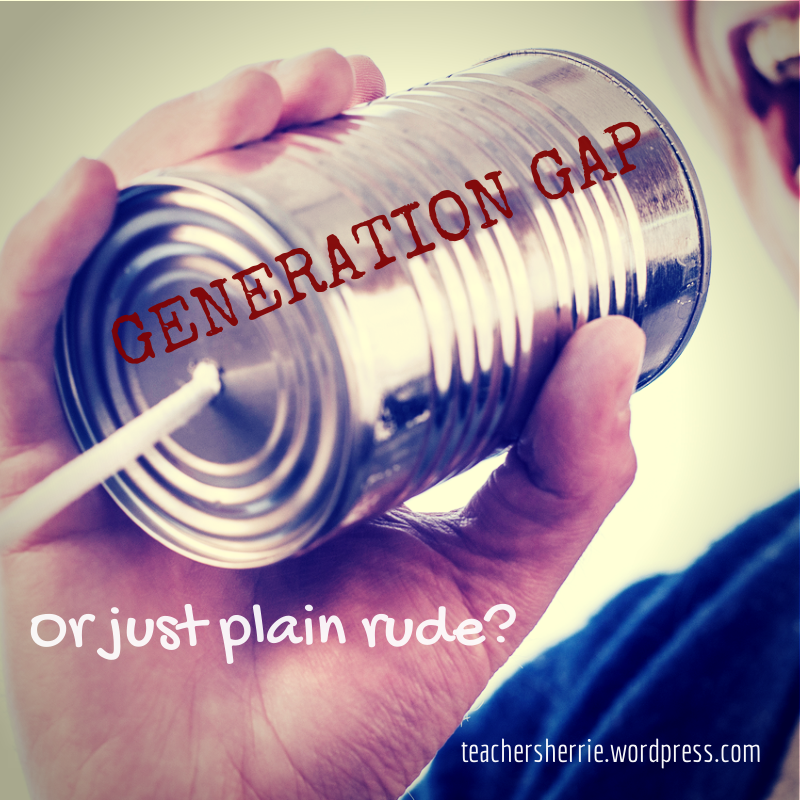 Generation Gap or Just Plain Rude? I could go on and on about how teenagers nowadays don’t know basic courtesy: how they let out expletives within earshot in a crowded lift, how they talk when the teacher is talking as if she didn’t exist; basically how they walk the road like they own it. But I really shouldn’t because one, there’s no end to that list, and two, I will start to moralize about who’s to blame. So let me talk about what I can do as a teacher, standing in front of a class of youngsters who can’t get enough of their phones, talk when you’re talking, and seem to do something else even when you’ve set them a different task? Enough with your phone already! What do I do when they can’t keep still for 10 minutes without reaching for their iPhone? I tried ignoring it as long as I thought they were more or less paying attention to the lesson but the more I let it happen, the more I was convinced that their mind was on some mindless gossip on twitter. So I made it clear at the beginning of the lesson: put away your phones or I will put them away for you. I’ve confiscated a couple before by placing them at the teacher’s desk but returned it to the student after the lesson. I think they weren’t too cheesed off since I didn’t spot any black faces. I had been generally tolerant of their behavior before and maybe they were just used to me already. Would this work in your class? However, I wouldn’t necessarily try it in a large class, like a lecture hall of 80 plus students. 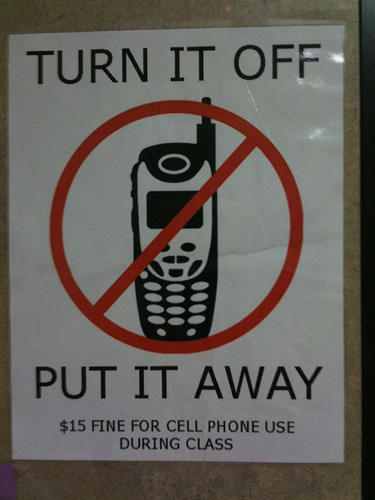 First, I would have to spend more time confiscating phones than teaching. Second, I they will hate my guts. Third, one and two make a really bad class. I think the best defense against a tech distracted crowd is to win them over with your superior tech display, e.g. 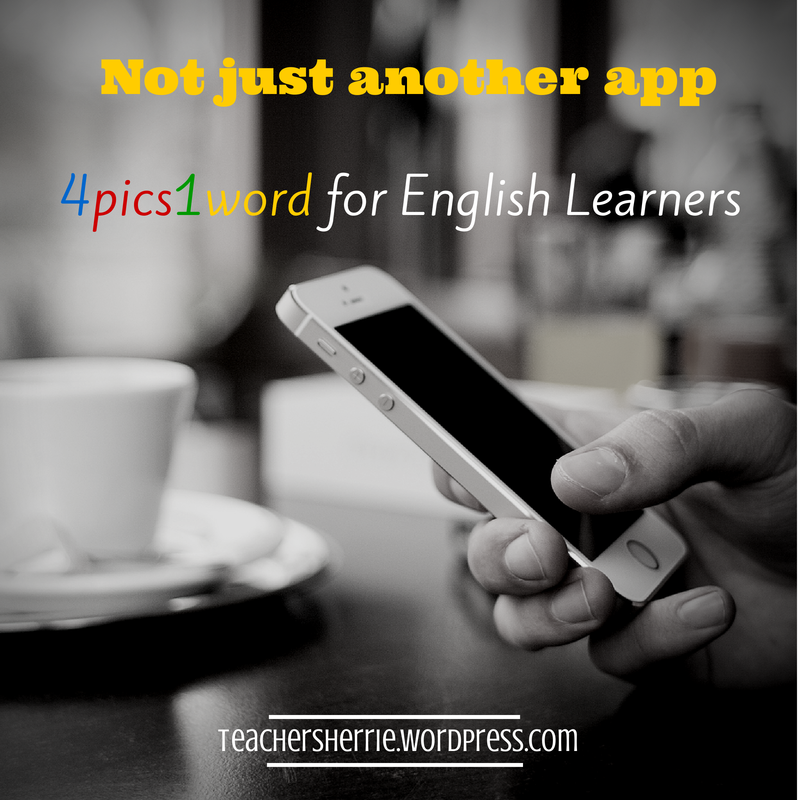 great eye-catching photos during presentation, a couple of well-timed videos, and having interactive activities like getting individuals and groups to come to the front to do something. And don’t forget the M&Ms to encourage participation! Most of my students tend to talk a lot more when I’m not the one asking them to do the talking. For example, when they’ve just come in to the classroom and they’re settling down, when they’ve finished an activity and the others are still working on theirs, or when I disappear from the classroom to get something. I have nothing against students talking in class – except when I’m talking and that usually means I’m trying to say something I think it’s important to them. What if they don’t get the cues? What if they get it one moment and forget the next? Well, I keep on reminding them until my cues are reduced to a glance, a stare or a glare. I don’t aim for total silence and I don’t want them to end up fearful of not keeping quiet. But I think through consistent reinforcement of the expected behavior in class, they will get the message. Texting on the phone and being a chatterbox are actually less disturbing behaviors than not following specific instructions in the larger scheme of things. I’ve had students who seem to insist on doing something contrary to what I’ve set the class to do. Thankfully this doesn’t occur often but when it does, it could mean the student is suffering from a behavioral disorder like Asperger’s Syndrome. It could also mean that the student cannot bring himself to complete the task because he finds no meaning in it. While I have not experienced the former, I have come across students who exhibit the second type of behavior. Usually, they find the work un-challenging or they already know the topic. So far from being rude, they just can’t bring themselves to do something which doesn’t help them learn anything new. What I do to help this student is to give him a more challenging task or point out aspects of the activity that he can still benefit from. To date, I’ve not had a resistant student. So in my encounters with less desirable classroom behavior, I conclude that the students don’t mean to be rude or challenging; they are just behaving in a way that’s most natural to them. I think it’s our job as teachers to remind them what’s appropriate and what’s not in class – and be consistent in setting our boundaries and ground rules. The last thing we want to do is to ignore them and let them continue with behavior that will not help them learn any better, or anything at all! P/S I teach in an Asian context where students are largely respectful of authority figures. PhD student and emergent scholar at Waikato University interested in Language, Literacy & Identity. Multi-tasker, tea-drinker, tech support, mum and more. Debunking evolutionism. Proclaiming Truth. Exalting the Creator. Exploring Creation. Edward Elgar Publishing's blog offers topical insight and debate from authors, academics and editors. Musings from Andrew Tui, a career practitioner with a love of coffee & ukuleles. Silverdale Normal School. A great school with a family feel, in the heart of Hamilton.